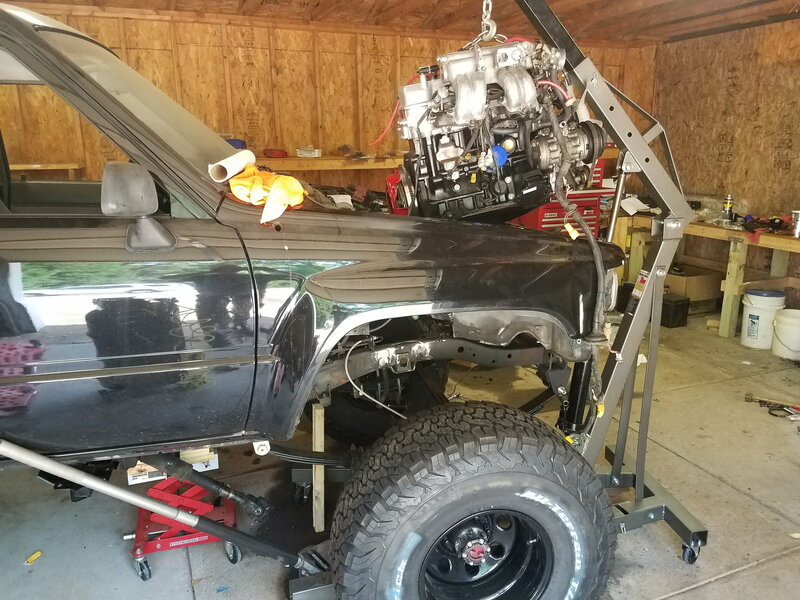 I just finished my 1985 4runner project. Now I'm working on tuning and interior stuff. I'm having and issue with acceleration. I've adjusted a few things and get two different results, perhaps someone can explain what's going on. Result 1 is high idle speed 1200-1400, tons of power, engine looks and feels like it's misfiring intermittently, causing the engine to shake/bump/etc each time it happens which is about once every few seconds. Also when I'm driving and up to speed, if I slow down and downshift to assist slowing, it is letting out like micro-backfires. Result 2 is idle speed 850, idling very smooth with no intermittent misfire, NO POWER on acceleration and doesn't start right up, I have to give 15% throttle to get it to fire up or restart it after turning it off for a minute. What I changed was adjusting the distributor to make it idle good and not misfire, but now has no power on acceleration, also adjusted idle screw (after putting a new O-ring and to make it work right). I thought it might be a fuel issue but injectors are basically brand new after being sent to a professional for cleaning, repairs and testing... putting out 200CC per 60 seconds. Maybe it's getting too much gas? and it's flooding out? It has a new distributor, fuel pump, fuel filter, new plugs and wires, new coil, new igniter, new AFM, new cold air intake (new air filter), new plugs. Engine is .400 over stock and has around 300 miles on it. My goal is to get it to idle from result 2 and get the start right up and tons of power from result 1. I can't figure it out so I'm here for help. Result 2 is what the FSM (factory service manual) explains how to set timing, idle, etc. Result 1 is how I've been running it so it actually has power and I can drive it around.. but again it's idling high, mini backfires, intermittent misfire, etc. THANKS! in advance for your thoughts and ideas. #1 is presumptively advanced timeing, but you don't tell us to what degree. The burble and pop you hear in the exhaust is incomplete combustion..
At any rate you should be running the highest octane available in your area if you are gonna fiddle with an above spec timing advance. Thanks for the reply Co_94_PU! To answer some of your questions, yes I believe it's slightly advanced to get the power to drive it around. FSM says to set it to 12' at idle AFTER initial timing is set correctly to 5' after the rebuild. I think it was at 14' to get the power. OK, so incomplete combustion... and is that caused by the advanced (too much) timing? I'm not sure what you mean by "set the idle adjust the timing then reset the idle and check.the timing..." The only way to change the idle is with the screw and I couldn't find anything in the FSM about "setting idle", help me out with that one please. Adjust the timing.. got it (by turning the distributor), then "reset" the idle... not sure what that means again, and then check timing got it. I thought higher octane fuel was HARDER to burn.. the more octane, the more the burn is retarded, no? What would running higher octane do for this engine? The highest I can get here in South Carolina is 92. Thanks again bud, look forward to more input. Higher octane fuel is less susceptible to combust due to heat, the usual example is forced induction however advanced timing has a similar effect of producing heat inside the cylinders. As the flame wave propagates across the cylinders the fuel ahead of it is compressed and heated by the "explosion". Idle speed is given in the maintenance section, around page nine. My process goes like this..
Set your idle to spec. Set your timing to the factory 5°. Verify it is still at five. Verify and adjust idle if necessary. Re check timing is in spec 10-14°. If either the idle or ignition timing goes out of spec start all over. I will give it a shot. It sounds like what the FSM explained when setting mechanical and electrical timing, but my memory isn't so good, I'll check again. I think I also forgot to mention that it only loses power under load. I can rev it all I want when it's out of gear and not a stumble. Put it in gear and give it more than 20% throttle... no power. Do the resistance checks for the throttle and air flow meter, specifically look for a clean smooth change in resistance from closed to open. Yes, the resistance on both the TPS and AFM are within FSM specs and move through the range smooth. I had a problem with the engine not starting after the rebuild and replaced pretty much all the components under the hood when I couldn't figure it out. It turned out to be particulate matter that builds up in the gas tank (over 33 years) and long story short, it ended up in the engine after the rebuild. Seized the piston rings in the compressed state and filled the block with a bunch of crap. Had to purchase new pistons (again) and rebuild the engine again and clean all the parts... it got in the valves, cylinders, all through out the head, cam, etc. After the 2nd rebuild and cleaning AND NEW GAS tank, filter, pump, lines, regulator, tore apart intake manifold to clean everything.... it runs! Update. Followed your advice for setting idle, timing, etc. Everything is set to FSM specs. Idle is set to 750 RPM at operating temp. Timing is set to 5' to set ignition timing before engine is started. Mechanical timing with crank and cam verified and set to FSM specs. Engine timing set to 12' at idle, used timing light to set as per FSM specs. RE-checked everything after everything was set and the numbers are holding. Engine still has very little power on acceleration. Interestingly enough, if I give it only about 20% throttle while trying to accelerate it "works" a little better, but no where near the power it should have. When I give more than 20% throttle on acceleration, it sounds like it's bogging down, making a fluttery airy noise and a quiet prop airplane noise. Confirmed the AFM was operating while running and the fuel pump is operating correctly. Fuel injectors were also sent off (a second time after getting clogged with above said crap from fuel tank) to be cleaned and had some parts replaced. The stock injectors were pushing 170cc per 60 second interval when initially tested. They now push 200cc per 60 second interval and are operating correctly. Hope this helps figure out the problem... I have no clue why it has no power. Again, if I adjust the distributor clockwise to about 85% of the range on the curved adjust slider deal, it will idle at higher RPM, have intermittent mini misfires (what it sounds like) but produces PLENTY of power. I re-geared it to 4.56 Yukon gears and it has 35" tires on 15" steel wheels. I have owned several other old yotas and always re-geared to 4.88 with 33" tires and this truck has way more power than those did, even with shorter gears and bigger tires. This engine block was "decked" producing higher compression, installed LCE header, Trailgear cold air intake, removed EGR system and removed Air injection system, so it breaths and flows A LOT better. Exhaust pipe is fairly short compared to stock with no Cat. It goes straight back from header and ends at the rear shackle mount. Also removed the PCV hose to plenum and replaced with LCE breather that just mounts on top of the valve cover. I talked with my uncle for about an hour and he says he knows what is going on, but doesn't know Toyotas, so hopefully someone here can help or has done this/encountered this before. When set to FSM specs, it purrs at idle (750 RPM, 12' advance E timing), like a brand new engine... which it is. When I go to drive down the road is bogs down. My uncle said it's running lean and due to the computer, AFM, TPS, O2 sensor, it's not getting enough gas on acceleration. This makes sense to me for a few reasons, The only part I haven't replaced/adjusted under the hood is the TPS. Also, the injectors WERE firing 170cc/60s interval and are NOW at 200 and working correctly, so it CAN give more than enough fuel, they're just not being TOLD to by the computers end results it's getting. SO, is there a way to trick the computer, TPS, O2 Sensor, AFM combo into thinking the throttle is closed MORE than it actually is without messing up the perfect start up/idle/RPM it's at now? Is there an after market O2 Sensor that is a "wide band" or faster responding for sale? I've read about adjusting the TPS on various forums, I think that marlincrawler guy has a really detailed write up about it. Anyhow, I've never done it because it seems like a nightmare... Any suggestions before opening this thing up and completely messing up? Also removed the PCV hose to plenum and replaced with LCE breather that just mounts on top of the valve cover. You've disconnected both ends of the PCV system? If either end is connected and not the other you have created a by-pass to the VAFM, this is unmetered air and can cause lean fire conditions. Last edited by Co_94_PU; 11-10-2018 at 04:25 PM. Adjusting the tps is a simple matter of loosening it's mounts and turning it on the throttle plate shaft. There is only one cavet, the idle contacts need to remain closed in the relaxed no throttle position and open with the slightest of throttle plate movement.. Your also likely confusing adjusting the vafm and the tps.. If you are going to.adjust the vafm.fro. the factory defaults properly mark the factory position with a good paint pen. 4Crawler (Roger), has helped a lot of people with that website no doubt. VAFM, Vane(d) air flow meter. It is a critical part of the air fuel mixture system. So generally a bad idea to go tinkering with it. It was of course designed by a team of engineers with more degrees than I'd be willing to school for. =D also a bad idea to get in there and change it without a wide band oxygen sensor hooked up. Your timing advance is what is giving you the big HP gains. Adjusting the distributor doesn't magically change the fuel mixture. IF there is any change to the fuel mixture it would only be due to a more complete burn before it gets to the oxygen sensor. In which case the ECU will add more fuel. In short I disagree with your "it is running lean" theory. Look for a write up by Jeff mosk about adjusting the vafm for his 22rte. It will give you some info on tuning. If you decide to under take this I highly suggest you either out a windband sensor and gauge on or pay the 50-100$ to out it on a dyno. Depending where you live you might even be able to get an emissions test shop to run the print out from thier wideband, probably cost about the same (slightly less but be less friendly also) as taking it to a proper tuning shop. Been driving it as is (advanced 14') a few days a week now for a couple months. Co 94 PU, you're right, it's not running lean at all. It's running rich. The plugs (I think I'm on a 4th set now LOL) all come out black. The brand new exhaust pipe is all black and even exposed a couple spots that weren't welded right (black soot all around a couple small holes along the pipe), also replaced the O2 sensor as it was all black as well. I found a tuning shop near me that said they'd like a crack at it and I've done enough so I'm going to get it to them this week so they can figure it out. Nothing has changed in the couple months (about 300 miles of driving). Still idles around 1200, has tons of power and has the micro backfire sounds when I let off throttle or downshift to assist slowing. I've noticed that when it sits at least over night, it starts right up on first crank. If I drive it for a bit and park, then return and go to start... it just cranks unless I give it about 20% throttle, THEN it fires up. If I never give it a little throttle... it just cranks and cranks without even a hint that it's going to fire up. I'll post up what the tune shop finds... and I also want to do a build up thread from start to finish on this project... think people might like that. 88 4runner 3vze. Idles fine when cold but not at operating temp.